When ETC began developing a lighting product for cycloramas, the company didn’t want to introduce just another cyc light on the market. It had to meet several requirements to be deserving of the ETC brand: the light would be bright, easy to use, provide seamless coverage, and comply with the high standards ETC sets for its products. The result is the Source Four LED CYC, an adapter that affixes to any Source Four LED luminaire, transforming it into a powerful tool to illuminate cycloramas. Using the x7 Color System, which combines up to seven LED colours in one unit, Source Four LED luminaires can provide a nearly limitless range of colours, from pure whites to refined pastels and vibrant, saturated hues. With the strong beam that the Source Four family is known for, the Source Four LED CYC can evenly distribute light across the cyclorama, so no gaps or seams are visible between the luminaires. The Source Four LED CYC is a convenient and budget-friendly addition to stocks of luminaires, because of the Source Four LED’s multi-purpose functionality. 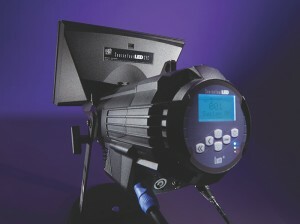 “Most venues keep a stock of lights that can only be used to light cycloramas,” explains Uphoff. “If a show doesn’t have a backdrop, those expensive fixtures are put back in storage.